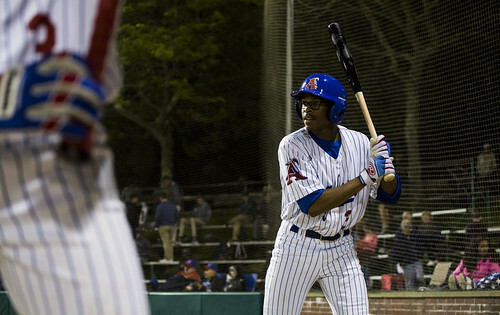 The Chatham Anglers (6-5-2) fell to the Falmouth Commodores (5-8), 4-2, in extra innings on Tuesday, marking the A’s first two-game skid of the season. The all-around performances that helped Chatham win or tie six of seven games from June 16 to June 22 have again become inconsistent. Here are some notes on how the A’s have fared on each side of the ball in recent games. Paired with Chatham’s recent skid has been one of its worst offensive stretches of the season. The A’s have scored 11 runs in the past 25 innings, its lowest tally over a three-game span since June 13 to 15, when they scored 10 total runs in a win, loss and tie. After the Anglers’ 8-6 comeback win against Bourne on Friday, Chatham manager Tom Holliday preached the importance of two-strike, two-out hitting. In the win, Chatham registered two such hits, including a two-RBI double from Spencer Torkelson (Arizona State) in the fifth inning to reduce the Braves’ lead to one. Greg Jones went 4-of-6 in Tuesday's loss, his highest hit total in a game this summer. The top of the A’s lineup continues to be thier most threatening, as John Rave (Illinois State) and Greg Jones (UNC Wilmington) have recorded nine of the team’s 23 hits in their last three games. Rave and Jones are two of three active Chatham players hitting above .300 on the summer. Most teams play better on the road than at home. For the Anglers, that has not been the case. Chatham is 4-1-1 on the road, but 2-4-1 at Veterans Field. While the A’s hit about the same on the road and at home, the pitching staff has thrown significantly worse at Veterans Field. In 59 innings at home, Chatham has given up 42 runs — albeit only 27 of the 42 have been earned — 44 hits and have walked 33 batters. In 49 innings on the road, the staff has given up only 10 runs, 37 hits and 11 walks. Since Friday, just two of the A’s four scheduled games was played to completion, a 6-1 loss in game one of Sunday’s doubleheader against the Cotuit Kettleers and a 4-2 extra-inning loss to Falmouth. Saturday’s contest against the Commodores was rained-out, while game two of the doubleheader versus Cotuit was postponed due to fog. With two off days this week — on Monday and Thursday — the Anglers will experience a few more interruptions before playing 22 games in 24 days during July. While the irregular stretch of games may lead to fatigue for some players, Holliday said it will help them get into a routine. In games after off days, the Anglers are 0-3. The A’s have tallied just six total runs in such games, while failing to score in the first five innings twice, the only two times that has happened this season. While plenty of runners have reached base in post-off day games, Chatham has struggled to get them home. The Anglers left 23 runners on base in the three games, including 14 in Tuesday’s loss to Falmouth. “I don't even know if they need a day off anymore,” Holliday said. With the loss of Torkelson, other players are going to have to step up their production. Holliday said there is a part of the order that must be better going forward. Over the last four games, the four-, five-, and six-hole hitters have hit a combined 6-for-40, which translates to a .150 average, and 5 RBIs. Jones and Rave — who hit in the first two spots in the lineup — have combined to hit 11-for-31 over that same four-game stretch, giving the hitters behind them plenty of chances to knock in some runs. Holliday said he is going to look for a combination at the three-hole and clean-up spot that works going forward, so we may see some different faces in those two spots over the next few days. After Wednesday night’s game against Wareham at Clem Spillane Field, the Anglers will have another off day on Thursday, their third in the past six days. Chatham returns to Veterans Field on Friday at 7 p.m. against the Yarmouth-Dennis Red Sox. Broadcast coverage of the Anglers and Gatemen on Wednesday begins at 6:10 p.m. with the Anglers Extra Pregame Show. Listen to Cooper Boardman and Josh Schaefer on TRZ Teamline or listen by phone at 1-800-846-4700, code 3841. For more information, visit Broadcast Central.